A little bit classic and a little bit contemporary, the Coventry collection provides you with stylish furniture designs wherever your tastes lie. The Coventry bedroom is simply styled with smooth case fronts and beveled edges, tapered block legs and brushed nickel hardware. These timeless pieces are then finished with a rich Dark Brown wood finish for a polished appeal. The centerpiece of the Coventry bedroom is an upholstered sleigh bed, crowned with a channeled vinyl headboard. Pair the stately bed with matching storage pieces to help keep your room organized. 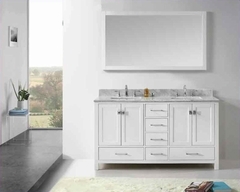 Give your bedroom a polished contemporary vibe with this subtly stylish dressing chest. 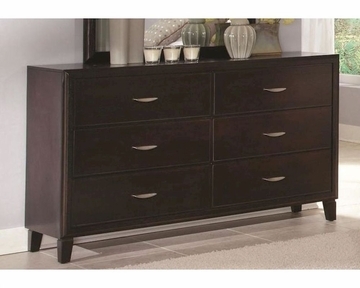 Understated smooth case fronts, tapered block legs, and nickel-brushed hardware create this beautiful modern look. Six drawers provide you with plenty of storage for clothes, linens, and accessories, and the metal-on-metal drawer glides prevent your drawers from tipping or falling out when holding your belongings. Pair this piece with a tall mirror to create a handy vanity set.